Usa Jingu Shrine (宇佐神宮) is the head of all Hachiman Shrine located in Oita. 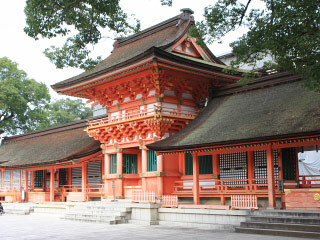 Hachiman Shrine is the largest shrine organization in Japan. There are over 40,000 Hachiman Shrine in Japan. It was established in 725. Hachiman is the name of Emperor Onin who is one of the great leader of Japan. Emperor Onin visit Usa when he was prince in 571. He established the new country here and helped the development of the land. The main building is the designated as the national treasure of Japan. It was constructed in middle of 19th century. It is highly respected with many people even today. 1. use bus to Usahachiman. Enshrines: Hachiman Okami (Emperor Onin), Himeno Okami(Munakata 3 godess), and Empress Jingu. Usa Jingu is the top of all Hachiman Shrines. There are about 40,600 Hachiman shrines in Japan. In 571 in the period of Emperor Kinmei, Emperor Onin visited Usa. Emeperor Onin broght the technology and calture of China and helped development of this land. In 725, people built shrine to enshrines Emperor Onin at this place. Land of Usa has been very important location besides Izumo and Kinai. Hime Okami were also highly respected before Emperor Onin visited here. People built 2nd shrine here in 731 to enshrine Hime Okami. In 823, people built the 3rd shrine to enshrine the mother of Emeperor Onin, Empress Jingu. Usa Jingu is highly respected by the imperial family for long years as the next to Ise Jingu. 2 bows, 4 claps, 1 bow. The main shrine of Usa Jingu is located on the top of hill. It was constructed in 1860 and registered as the national treasure. It takes Hachiman Style Building. Hachiman Style has two A shape roofs together. It is registered as the national important caltural asset. It was constructed in late 16th century.